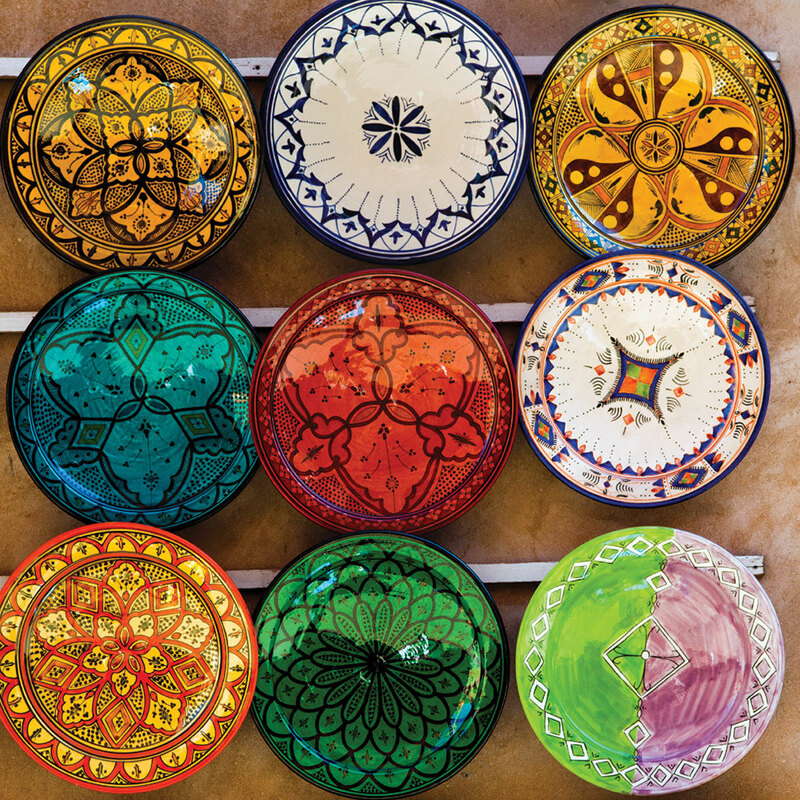 We set out on Thursday afternoon from Rabat on a train bound for Marrakech. We each carried a backpack, a small duffle bag, and the shared vision to climb the tallest peak in North Africa: Mt. 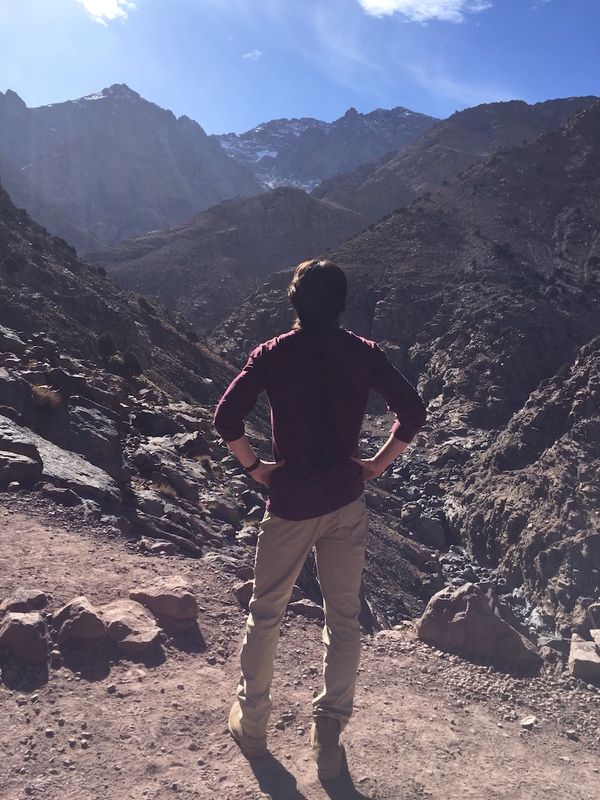 Toubkal. At 4,167 metres (13,671 ft.), Toubkal towers over the High Atlas mountain range, situated about an hour’s ride from the city of Marrakech. Upon boarding we found the compartment to be mostly full with only a few free seats scattered about. The close quarters and afternoon sun trapped the heat of many bodies inside until someone thought to open a window. My friend, Jacob, and I were separated in order to obtain our own seats, so for over four hours I read, slept, and observed the other passengers in silence. A young girl peered over the headrest diagonally from me, fascinated by the many strangers sitting around her. Eventually her eyes turned toward me, so I puffed my cheeks and stretched my ears into my best monkey impression- apparently it did the trick. She giggled uncontrollably until being hushed by her tired mother. There is no better language for communicating with a child than warping one’s face. We disembarked at Marrakech late in the evening, joining the other travellers jostling on the platform to secure the first taxis outside the station. Nimble as we were, weaving through the crowd proved no problem, and soon we had negotiated a ride to Djemaa el-Fnaa, the main square in the old medina. By 9pm we arrived at Rainbow Marrakech, a hostel not far out of the main square, nestled in one of the medina’s many side alleys. The interior décor fit the name, with each colour in the spectrum receiving fair representation on the hostel walls. Our hosts were friendly and happily spoke English with us, proceeding to make our comfort their first priority. We had tea after dropping our bags, half planning for the upcoming climb, half tuning in to the other travellers lounging about telling stories. Hearing tales of their impressive travels added a sense of humility to our own journey. No matter the distance you go, the bizarre things you see, the isolation you feel, someone else has gone farther, seen stranger, felt lonelier. In no time I was asleep, dreaming only of the mountain looming quietly not far away. We left early Friday morning after breakfast, carrying only what we thought we would need for the mountain. The rest of our things stayed under the gracious care of the hostel, to which we would return in two nights time. 50MAD later we were riding south with five Moroccans under the mild winter morning sun. Outside my window the outskirts of Marrakech turned gradually to open lands that stretched flat for miles, broken abruptly by the towering scars in the Earth’s face on the near horizon. I was struggling to remember a history lecture from one of my professors in which he passionately explained the topographic features of Morocco, but unfortunately I had nodded off during that talk. The view before me proved slightly more engaging. Within an hour we were approaching the foot of the Atlas and left the comfortable, straight highway behind, exchanging it for the meandering path of the mountain. Our driver was clearly experienced in this route, knowing precisely when to slow down, when to move over, and when to swerve violently to avoid the occasional tour bus, all at the fastest speed possible. Thankfully, we did not have to endure more than half an hour like this, but to his credit I was wide awake by the time we reached Imlil, our final stop. 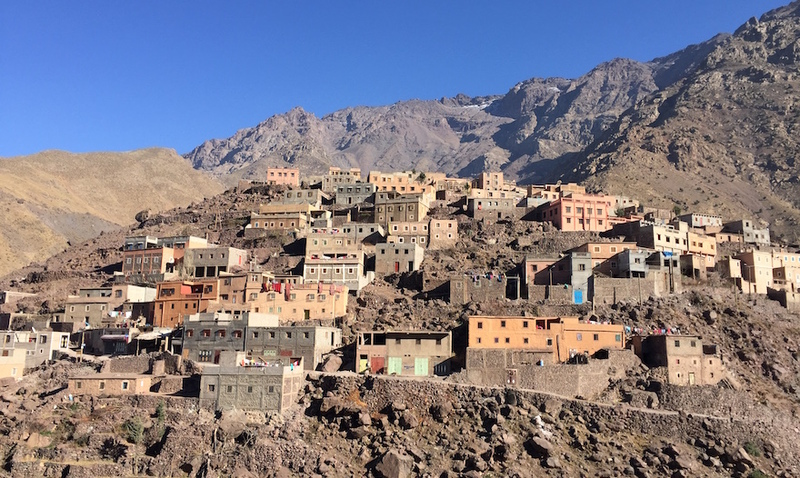 The village of Imlil lies 1,740 metres above sea level, and serves as the launching point for many Toubkal expeditions. Small homes line the hills and narrow valleys along the river. Walnut, apple, and cherry trees that, come springtime, would fill the region with rich colors and smells were stripped bare by the winter days. Yet the nearby fields are irrigated from the river and contain the greenest natural grass I have every seen, made more vibrant by the cold, grey stone walls and rock fields that surround them. The streets carry the faint cries of many chickens, goats, and mules, a pleasing sound on our ears as we walked through Imlil. Having lived in Rabat for some time, I was reminded of how durable the human race is, equally able to inhabit villages locked high in the mountains as we are great cities by the sea. It was not until half an hour of walking had passed that we felt truly on our way up, the village features well behind us. The hike to the refuge is mostly a gradual ascent interrupted by some flat sections and the rare steep tract. There are a few huts along the path and, more notably, the small settlement of Sidi Chamharouch in which the tired climber can stop for a drink or meal. Content with our snacks, we pushed on. We crossed hikers from a number of different countries during our ascent. We exchanged a “Salem” with those coming down, who offered us a cheery reply, while those we passed going up nodded grudgingly at being overtaken. This montage included a trio of Scotsmen, four Germans, a Finnish couple, what I thought to be a group of Russians, a few Americans like ourselves, and mainly Moroccans. One of the rooms was heated to a glorious 20°C by a wood fire, the only one of its kind in the refuge, so we had dinner there. We quickly worked our way through a traditional Moroccan tagine with chicken, an exceptional meal to recover our strength for the second leg. Also dining were four British men in their late twenties who had been climbing various peaks during the last two days, the refuge keepers, and two Canadian women who had summited earlier that afternoon. After dinner, we passed the time reading under electric lamplights scattered about the room and playing chess on a makeshift board provided by our hosts. I lasted a couple of hours before reluctantly retiring to the bitterly cold bedrooms upstairs. I was much in need of sleep. Both Jacob and I wore most of the clothes we had brought with us, though he had the luxurious addition of his hat, for which I envied him. Regardless, we were in for a cold night. 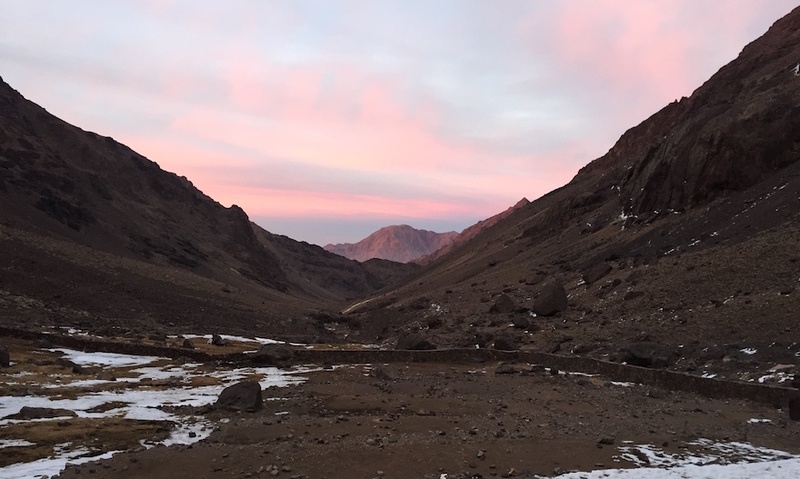 Part two of To Toubkal and Back can be read here. 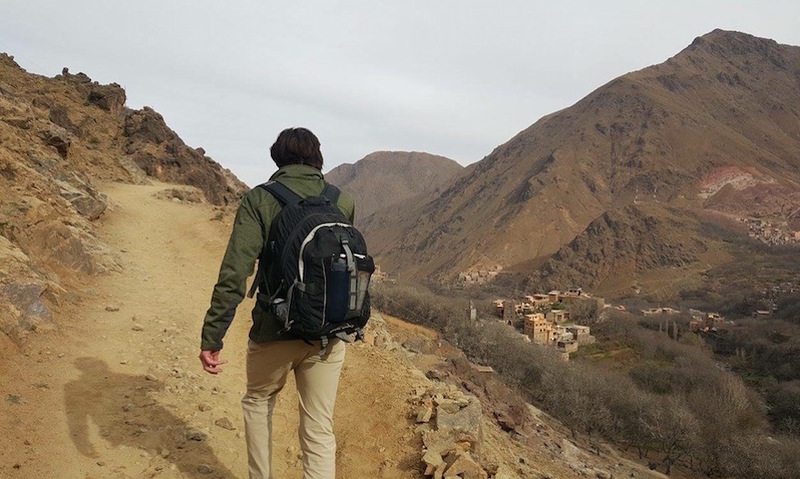 Andrew Mines is a student at the University of Chicago who is studying abroad this quarter in Rabat.